Another Canadian Monetary Policy Report, another delay on the projected date for GDP to return to potential. In the previous report (July), GDP was projected to hit potential in mid-2015; the date has now been rolled back to the end of 2015. The Bank has thrown in the towel on giving rate hike warnings to scare consumers from levering themselves up to their eyeballs, and has moved back to a balanced assessment of risks. 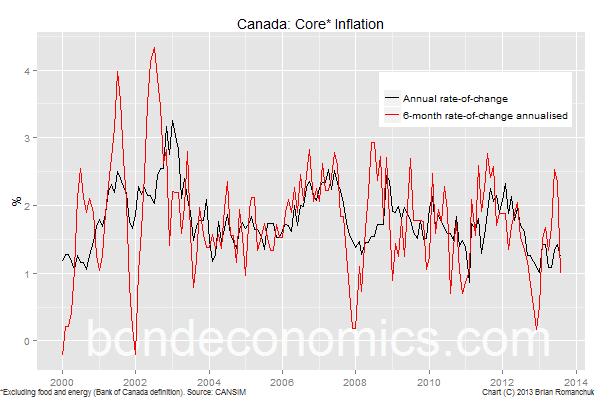 Earlier this year, core inflation looked a bit more energetic, but the six-month rate of change has dropped off again to 1%. All the Bank can do is hope that the long-awaited capital expenditure surge will take place and give the economy a bit of a lift. If that does not occur before the housing market burns out, things could get interesting on the inflation targeting front. Going into a recession with inflation only near 1% could cause a significant miss of the 2% target. Canada provides yet another example that "stimulative" monetary policy does not appear in fact to be very stimulative for the real economy. So glad to hear I'm not the only one who rolls my eyes at the constant postponement of Canada's return to potential. "Going into a recession with inflation only near 1% could cause a significant miss of the 2% target." ....and delays household debt reduction (which was a BoC objective under Carney).